ATLANTA, May 25, 2017 /PRNewswire/ -- Aaron's, Inc. (NYSE: AAN), a leading omnichannel provider of lease-purchase solutions, and its divisions Aaron's and Progressive Leasing, surprised teens on Wednesday with a newly renovated Keystone Teen Center at the Don & Sallie Davis Boys & Girls Club of Greater Milwaukee. The event marked the 21st refresh by Aaron's and Progressive in communities across the U.S.
Keystone teen members of the Don & Sallie Davis Boys & Girls Club of Greater Milwaukee were surprised on Wednesday when associates from Aaron's, Inc., a leading omnichannel provider of lease-purchase solutions, and its divisions Aaron's and Progressive Leasing, unveiled a newly renovated Keystone Teen Center. As part of Aaron's three-year, $5 million national partnership with Keystone, Aaron’s associates have remodeled 21 Keystone Teen Centers across the U.S.
Aaron's, Inc. (NYSE: AAN), a leading omnichannel provider of lease-purchase solutions, and its divisions Aaron's and Progressive Leasing, surprised teens on Wednesday with a newly renovated Keystone Teen Center at the Don & Sallie Davis Boys & Girls Club of Greater Milwaukee. As part of Aaron's three-year, $5 million partnership with Keystone, inspiring teens to "Own It" by building the lives they deserve, Aaron’s associates have remodeled 21 Keystone Teen Centers across the U.S. Through a partnership with Boys & Girls Clubs of America (BGCA) and input from the teen members, Aaron's associates and Club officials worked on Monday installing new furniture and computers in lounge, study space, and games areas at the Club. On Wednesday, Aaron's associates and Club officials unveiled the new space, which is now equipped with new technology, sectionals, tables and chairs and sound systems. "The Don & Sallie Davis Boys & Girls Club is one of the busiest youth programs in Milwaukee, serving over 300 kids in a day, and it's vital to make sure those teens can enjoy a safe and positive environment," said John Robinson, CEO of Aaron's, Inc. "Aaron's is excited to make this contribution to Milwaukee teens so that they can continue to develop their leadership and community service skills." 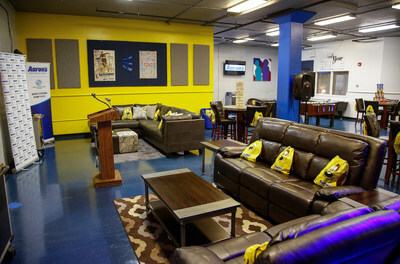 The 20 previous Keystone Club makeovers have included Boys & Girls Clubs in cities such as Los Angeles, San Antonio, Nashville, Las Vegas, Chicago and Miami. The makeover at the Don & Sallie Davis Boys & Girls Club of Greater Milwaukee includes an additional in-kind retail donation valued at $29,000. 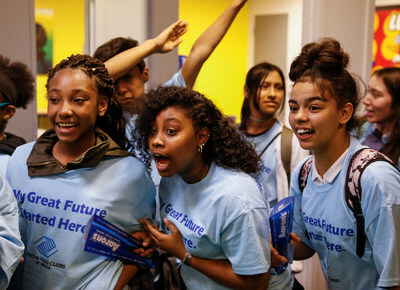 "It was such a thrill to see the surprise and happiness on all of our teens' faces at this surprise unveiling," said Vincent Lyles, President & CEO, Boys & Girls Clubs of Greater Milwaukee. "The Don & Sallie Davis Club is an invaluable resource for the Milwaukee community, and we're so grateful to Aaron's for inspiring our teen members so they can become leaders in their communities and beyond." To see photos of the Keystone Club remodel at the Don & Sallie Davis Boys & Girls Club of Greater Milwaukee, visit Aaron's on Facebook (www.facebook.com/aaronsinc), on Twitter (www.twitter.com/AaronsInc) and at www.AaronsGives.com.